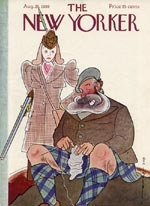 While The New Yorker magazine is known for the quality of its writing, many people also recognize the distinctive cover style and cartoons featured in the magazine. On this page we feature a selection of original cover art from 1939. The covers are noteworthy for the range of their subject matter - sporting activities, life in cities - both small and large - and politics. Where possible the name of the artist is identified. The selections presented on this page include covers by two of the best known New Yorker artists - Perry Barlow and Rea Irvin (who also did the cover for the very first New Yorker featuring the fictional Manhattan dandy Eustace Tilley). The appeal of The New Yorker covers is best summarized by the following description from a book on the history of the magazine: The covers capture "A special moment, fleetingly observed".